Six tips for keeping pet messes under control. Pets have an undeniable talent for making us laugh and completely turning around a bad day, but these emotional perks don’t come without a serious investment. They may be cute, but these furry friends can also get messy. Coming home to a warm, cuddly friend not only means increased responsibilities but often a complete shift in your current lifestyle and your cleaning routine. 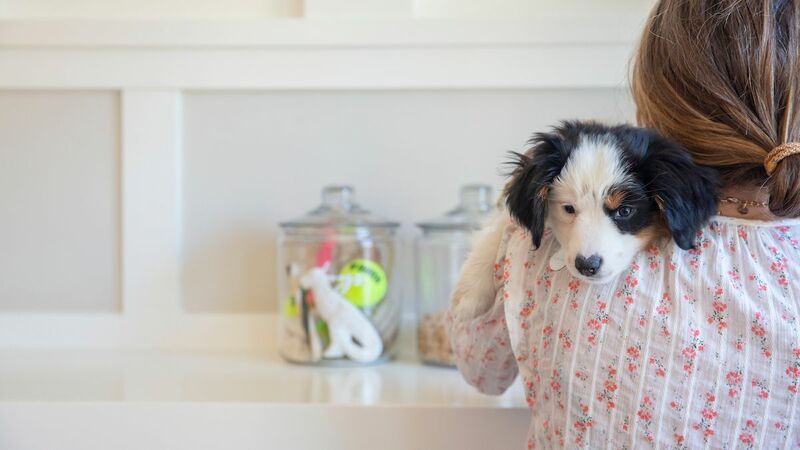 Though having a pet may create some initial challenges, home organizing guru and new puppy parent Shira Gill proves that proper preparation is the key to keeping your trusty companion safe and happy while keeping you sane. Pets can’t help but track dirt and grime into the home, and when it’s raining…forget about it. Looking for a simple solution? 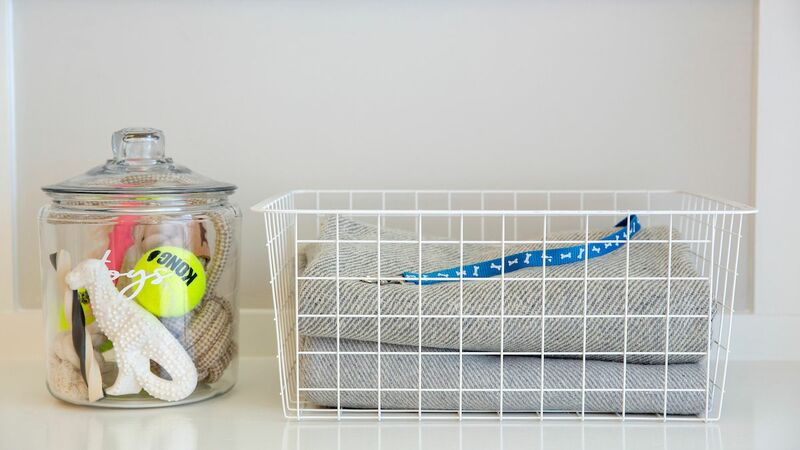 “Stock a few clean towels and a pet cleaning glove (like this one!) in a convenient spot in your entry or mudroom,” Gill suggests. “A quick wipe-down will make a world of difference.” Add to that a high-quality doormat and a washable throw rug, which will help corral outside dirt before it even enters your home. Grooming your furry friends on the regular will decrease shedding hair and dander on clothing, floors, and furniture. “Set up a regular grooming schedule or outsource with your local groomer,” Gill says. She also recommends keeping the bathroom stocked with pet shampoo and grooming essentials for easy access. “A regular cleaning schedule will help ensure that hair and dirt don’t build up,” she explains. “Practice minimalist principles and invest in fewer, better things for your pets,” encourages Gill. Instead of splurging on all the latest toys, outfits, and gadgets, limit quantity and invest in quality. Still have too many things to manage? “Donate any gently used items to your local animal shelter, and store the keepers into one centralized vessel—any bin, basket, or container will do the trick,” she advises. There’s nothing like waking up to a clean home, especially on a busy morning. Gill’s secret: “Before you turn in for the night, practice the 5-minute-tidy to restore your home to its former glory. Gather up stray toys that have migrated all over your living spaces and return them to their home. 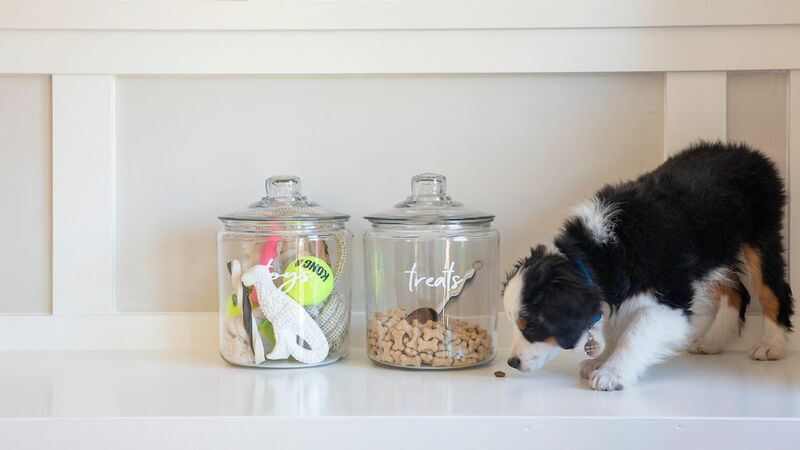 Hang dog leashes and stow poop bags, put away grooming accessories, and rinse out food and water bowls.” This simple trick will keep you from having to scramble around the house for any misplaced items. 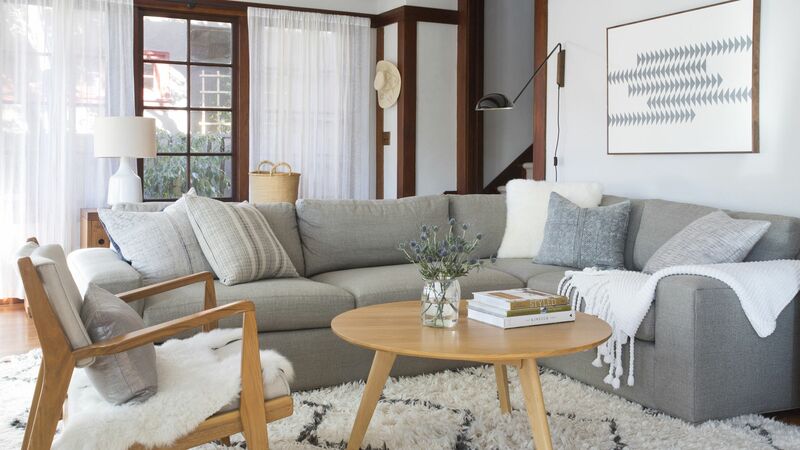 “Think of it as an instant reset for your space” Gill says.